Allegro designed in to our production machines. At TubeX we did have some ideas of CNC-winding a fiber glass around our mufflers inner core's. For this daring project we searched for a control-, drive-system which was not too expensive, as that the outcome could be a total failure. At Optimal Engineering Systems, Inc. Systems we found the ALLEGRA control-, drive system we were looking for. We did successfully complete the project, and can say that the system runs more than twice as fast as set out for. In general it's a small and very dynamic lathe where we wind a fiber glass from a reel onto an inner core. We are very satisfied with their pre- and after-sales and services. Actually we are that satisfied that we ordered a second system for upgrading a conventional profile bender into a CNC profile bender. Laser Repair System Your service to customer excellent like the system we bought, three are working good, reliable, low cost, I am very satisfy with your product. 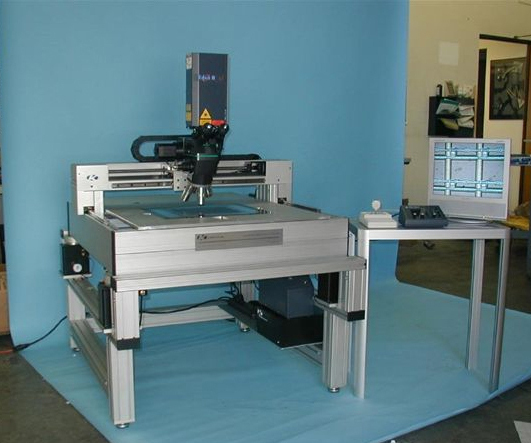 We use the OES 3-axis programmable motion control system to control a customized microscope stage designed to hold 200 mm diameter semiconductor wafers. The stage is controlled either with the OES joystick or programmable with function Click to Get a Quotes through the RS232 interface. We need to transfer wafer in a ultrahigh vacuum chamber from one to another. Space and precision are what we care about. We need an automatic system to accomplish this task, in which case two stepper motors are needed. One is for linear motion of the transfer arm, the other for rotation of the arm. The service from the company is good, as well as the quality of the products. We have used the 2-axis programmable motion control system from OES for our research project. The project was to build a sun simulator. We wanted to simulate the motion of sun around the earth for a particular day, time and location. This is used for the real time verification of Building Integrated PhotoVoltaic System simulated on computer using software packages. Optimal Engineering Systems, Inc. Systems has a very good customer support and their guidance throughout the project duration is appreciable.